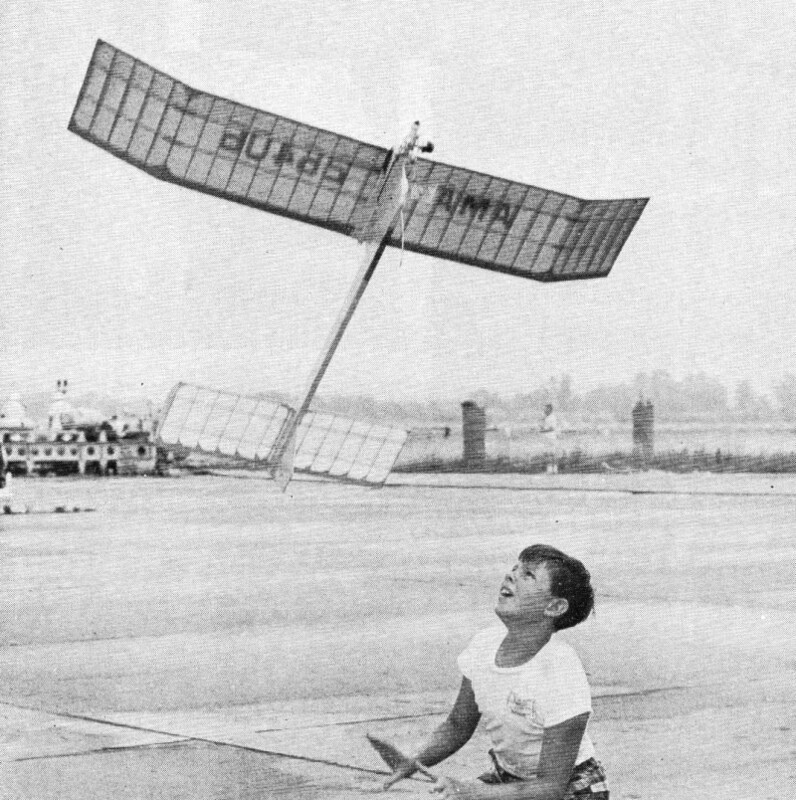 Technical details of gas-powered free flight have changed since this article was published in a 1968 issue of American Aircraft Modeler magazine, but the basics of construction, rigging, and flight trim are the same. Free flighters like to say that their particular facet of aeromodeling is the purest form since success or failure depends on the practitioner's ability to master all the 'natural' forces acting on their craft. I agree to a point, except that unless you are considering the whirlybird flight of a maple tree seedling heading earthward or a similar airborne inanimate object, the fact is most flight in nature is controlled either by the animal exercising the ability or a human inputting some means of control over the aircraft's flight path. 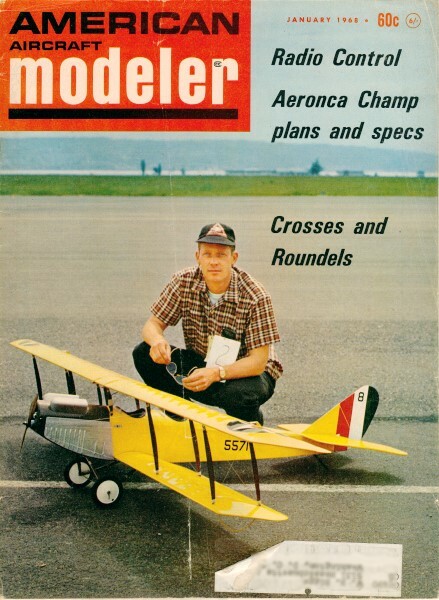 That's not to knock the often envious ability of a free flighter to trim his model for a perfect flight, but let's not put him on a pedestal any higher than a champion control liner or R/C pattern flyer. This article asks and answers the questions necessary to get you into the air with a contest-winning free flight. If some of the terms are mysterious, you will find a glossary of terms at the end of the article. Where do I start? You can expect to spend $20 if you buy the "best" new equipment for a 1/2A contest model. If you already have a suitable 1/2A engine, the cost might be as low as $5, or less. It all depends on what you already have. Let's assume that you have to start from scratch and that you have a $20 bill. First, we'll want a good contest engine. Young Marty Thompson VTO's a Class B gassie at AMA's Nationals. Ten mad seconds of climb, minutes of quiet gliding. What kind? Well, after looking at the contest winners columns in the national magazines, we see that practically all of them are using the Tee-Dee .049 - cost $9.95 (plus tax in some places). Next we know that the plane kit must also be a proven winner. Two kits stand out - the Viking and the Starduster. The cost is about the same - $3.50 to $3.95. A few more things will be needed. First is a timer to shut off the engine, and a fuel tank. A Tatone timer sets us back $4.50 and a Tee-Dee tank mount adds another $1.85. You need glue, clear dope, dethermalizer fuse, perhaps a couple more sheets of Jap tissue (to replace what you will waste), a propeller (6 in. diameter by 3 in. pitch), and fuel. Clear a space on your work bench (or kitchen table, if it's O.K. - be sure to put a building board down under the plans). Read the plans again, carefully this time. Read everything! When the plans are thoroughly understood, carefully cut out all the die-cut parts and pieces that are printed. Use a sharp razor or X-Acto knife. Lightly sand off the fuzz on the edges of the cut-out parts. Pin the plan down to begin construction of the wing. Cover the wing portion of the plan with a sheet of waxed paper, so the glue won't adhere to the plan. Cut off the leading and trailing edge stock, exactly as indicated, and the spar or spars, too. Pre-glue all joints. By that we mean to put a light coat of glue wherever the ribs join with the other surfaces, and then rub the glue into the wood with your fingers. Do this to all mating parts. Notch the trailing edge (Sketch 1). Pin the leading edge to the plan, place the spar in position, line up and pin down the trailing edge. After the pre-glue coat is dry, coat with glue all the joints on the rib and slip each one into its place, making certain that they are snugly pushed down, so that the bottom of each touches the plan. Don't add the ribs at the dihedral breaks yet - they are added later. 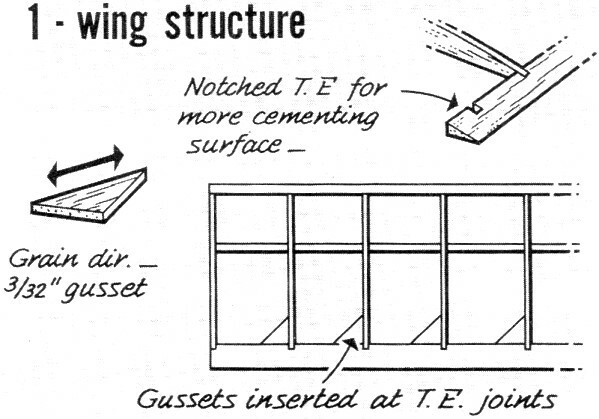 While all of this is drying, cut diagonal gussets and insert along the trailing edge joints (Sketch 1). This gives additional rigidity and helps to counteract warps. Allow the wing to dry at least several hours, preferably overnight, still fastened to the plan. If you wish, you can add a fillet of glue to all joints to insure strength. 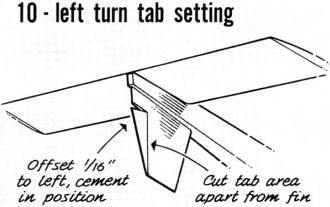 To do this, cut a piece of balsa to a thick point and use this to work the glue around all joints. 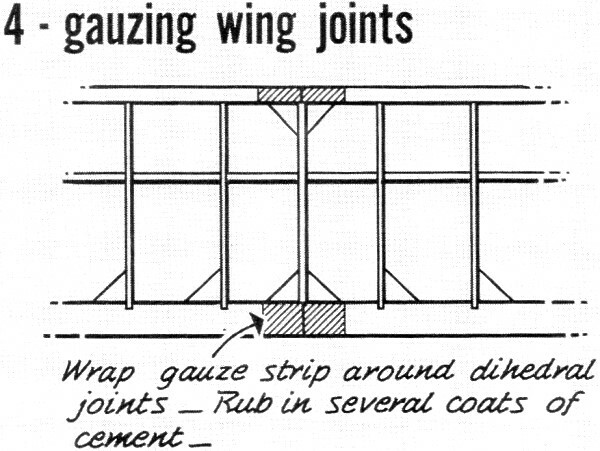 The stabilizer is built in the same way as the wing, but don't add gussets along the trailing edge joints, except where indicated. After the wing and stab are completely dry, you are ready to add dihedral and to shape the leading edges. 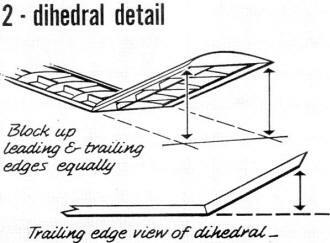 Adding dihedral to wing: Dihedral provides stability in your plane. If you are careful with this step, you will have fewer problems in flying, and fewer warps. Sand a slight angle at the top ends of the leading and trailing edges of your wing where the panels join each other (i.e., where the main panels join to the tips, etc.). Pin the main panels securely to the plan after pregluing all joints. Then, after the glue has dried, add another coat of glue and pin the tip wing sections to the main panels (Sketch 2), blocking up the tips the distance required on the plans. Be sure that the trailing edge half is blocked up the same amount as the leading edge. While this is drying, add the necessary gussets and joint ribs. When this assembly is dry (allow at least several hours), add the dihedral to the center panels - in the same manner as in the tip panels. Again, be certain that both the leading and the trailing edges are blocked up exactly the same amount. Shaping the leading edges: There is a definite shape prescribed for the wing and stab airfoils. 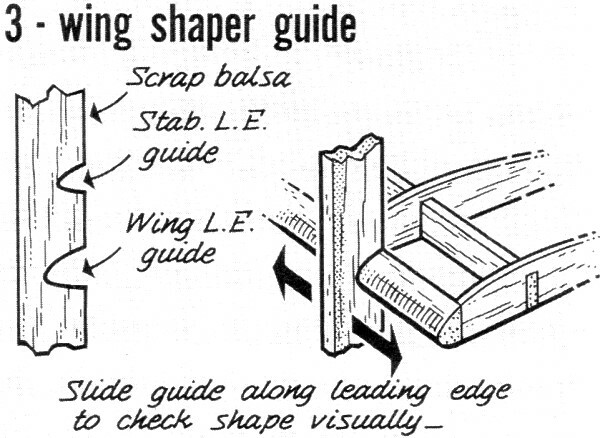 Cut a piece of scrap balsa to this shape (Sketch 3). Carefully carve and sand the leading edges to conform to this shape. Use your scrap balsa guide frequently to check this. When done carefully sand, with extra fine sandpaper, the entire wing and stab structure, removing all bumps of glue and balsa. 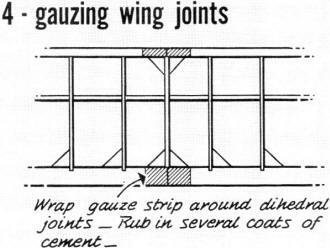 For additional strength, glue a piece of gauze or silk to the dihedral joints on the wing's leading and trailing edges. Rub three coats of glue over it - until it dries to a dull gloss (Sketch 4). 1) Dope all leading and trailing edges, all dihedral joint and tip ribs, both on the top and bottom. Sand very lightly and dope again. If your model has an undercambered wing (as in the case of the Viking), also apply several coats of dope to the underside of- each rib. This pre-doping gives the tissue something to "grab" onto, stops it pulling away. 2) Cut your tissue so that the grain runs lengthwise (spanwise) with the wing or stab. In order to find the grain of tissue, tear a corner slightly; if you are tearing with the grain, it will be a "straight" tear - if not, the tear will be jagged. Cut the tissue you plan to use at least an inch oversize, so you have some leeway in case of goofs. 3) Always cover the bottom and then the top of the same panel before going to the next panel. Always cover the center panels first. 4) Always dope the leading and trailing edges and the dihedral ribs heavily, then immediately put the tissue over this area. Work out all the large wrinkles by pulling gently and rubbing on the edges of the tissue. Try to pull evenly so the grain remains running directly span-wise. This minimizes warpage. It is a good idea to have a bottle of dope thinner nearby along with a brush - just in case you have made a severe mistake in applying the tissue, then you can brush thinner over the offending part, releasing the tissue from the structure. 5) Always lay the tissue evenly on the leading edges first and then pull snugly to the trailing edges. After the dope is fairly dry, dope right through the paper on the leading and trailing edges and the dihedral ribs. 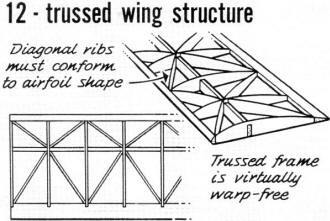 If your wing is under-cambered, dope through the tissue onto each wing rib bottom. It will be necessary for you to press your finger along this dope line to make the tissue adhere to the underside. After the dope has dried on, the bottom of each rib, turn the wing over and add a small bead of dope along each rib bottom where it meets the tissue. This insures that the tissue will not pull away from the frame. 6) After the wing has been covered and has dried, sand the excess paper off carefully and then run your dope brush around the edges to bond the tissue fragments to the wing. 7) Sprinkle water over the entire wing (or stab) and set on a level place to dry. (I use a drawer to allow the wing to set down fiat.) This will pull out all the minor wrinkles, and if you set your wing up on its leading edge or on a drawer, it will not warp while drying. 8) Only after the wing (or stab) is completely dry, do you dope it. Usually four or five thin coats of fuel-proof clear dope is sufficient. Be sure you have added your AMA numbers to the right-hand top of the wing panel. If you want a high gloss finish, simply keep doping. Some modelers will put on ten or 12 coats of dope, but remember every additional coat will add just that much more weight. 9) Set the wing and stab aside in a level place so that they will "cure" while you construct the rest of your model. The fuselage: It must be light but strong, therefore pregluing is desirable. Be certain that the wing and stab platforms are level and installed exactly according to plan. 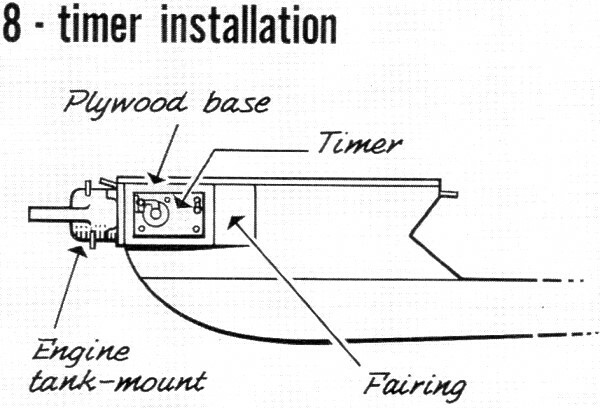 The rudder is mounted on the bottom of the fuselage, in the case of the Starduster. Try to align the fuselage so that it is perfectly straight, and care must be taken to see that the rudder is lined up correctly, too. The motor pod installation is very important. It must be strong, and exact. 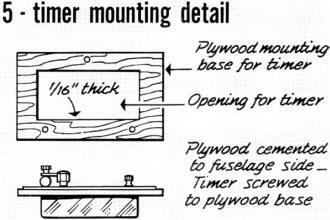 Drill the plywood firewall and mount the nuts (blind nuts are preferred) so that the tank mount can be bolted to it. Check its fit. Make your corrections now. Glue three nuts securely in place. Glue the firewall to the pylon - pre-glue and use plenty of glue afterwards. Use white glue, if possible, on all hardwood joints. Be sure that the firewall is facing dead ahead with no side, up or down tilt. Reinforce with the gauze inside of the firewall where it joins the pylon, and rub into it several coats of glue. 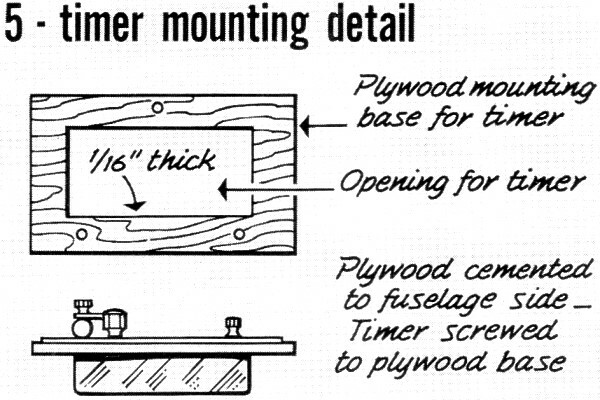 Add the balsa sides, being sure to cut the left side so that it will ac­commodate the tick-off timer (Sketch 5). Glue on the pod bottoms and end plates. Glue a strip of gauze around the entire firewall and then fold it, so that it is also glued to the balsa pod sides and bottom. Rub several coats of cement into the gauze. Allow to dry thoroughly. When doping the fuselage, be certain the firewall area gets six or eight good coats to help seal and fuel-proof it. 1) Dope the entire fuselage and rudder, sand lightly and dope again. 2) Cut your tissue - grain lengthwise - so you can cover one side at a time, with a 1/2-in. overlap at top and bottom. Dope a small section of the fuselage at either end. Attach one end of the tissue at these points, smoothing out the wrinkles. Then, holding the tissue away from the fuselage, dope the rest of the fuselage side. Pull the tissue tight and smooth it onto the doped wood. 3) Repeat for the other side, the pylon and the rudder. The overlap on the fuselage can be doped onto the fuselage top and bottom, or can be trimmed off. Cover the top and bottom of the fuselage in the same manner. 4) Do not water-shrink tissue on the fuselage. Simply apply several coats of dope, and it's finished. We are ready to install the wing hold-down dowels. Drill the necessary holes according to the plan - right below the wing rest platform. Drill them at least one inch deep; coat a 1 1/2 to 2 in. section of dowel with cement and push into each hole. 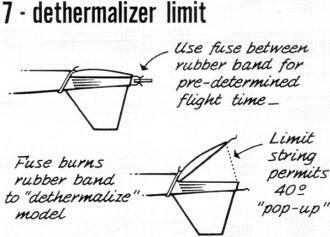 The stab rigging is more involved so that the plane can dethermalize. You don't want to lose the model because of carelessness. 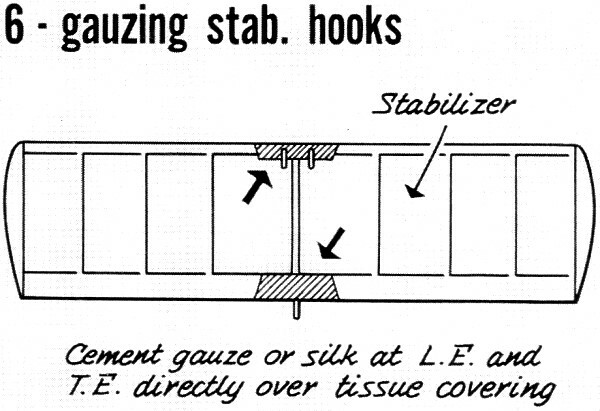 Using paper clips, bend two hooks as indicated on the plans and insert, after gluing well, into the false ribs on the front end of the stab. Bend another clip and fasten to the back of the stab - glue securely. After the glue has dried, cut a thin slice of silk or gauze and glue it onto the wire and the stab. (Sketch 6.) 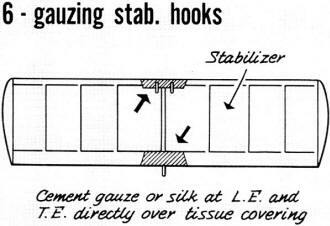 Glue another hook onto the rudder, as indicated. Fasten the wing and the stab to the fuselage with rubber bands. Line them up so that they are exactly centered on their respective mounts. Using 1/8 in. 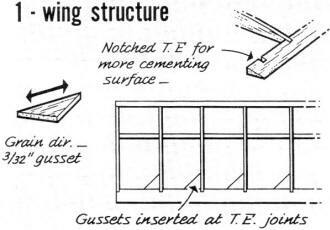 dowels split in half, glue them on both sides of the wing and stab right next to the platforms at the leading and trailing edges. This insures that the wing and stab are always put back in the same place when you rubber band them together at the field. After the keys have dried, tie a limit string or wire to the trailing edge of the stab and fasten the other end of the string to the fuselage. Allow an angle of about 40 degrees (Sketch 7). Securely glue the string or wire. Mounting the engine and timer: Let's finish the assembly. Put the propeller on, and bolt the tank mount to the firewall. Bolt the engine to the tank. 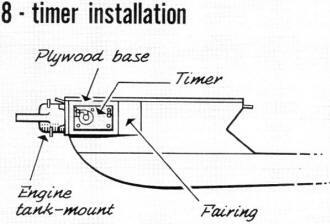 Install the timer using the small screws that come with it. (Sketch 8.) Cut a length of fuel line that will go from the fuel tank, through the timer loop, to the engine without kinks, or being loose and floppy. Before we take out the ship, see that the balance point falls within 1/4 in. of that indicated on the plan. If the balance point is more than a 1/4 in. off, add weight to the nose or tail to compensate. Be sure of the keying and dethermalizer setup. Go out on a day when the wind is mild or not even blowing (that'll be a day to remember! ), Go to a field where the grass is at least a foot high. Be sure that wing and stab are well rubber-banded down. Facing the wind hold the model at the bottom just underneath the wing trailing edge and give it a smooth, easy toss to a spot on the ground about 50 ft. in front of you. 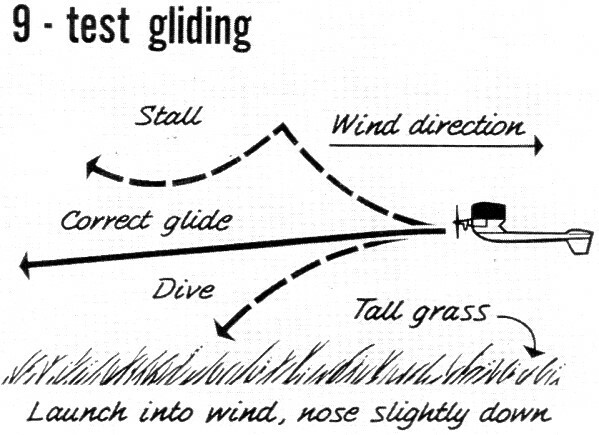 It should glide in a straight line to the ground - with perhaps a slight left turn, but it probably won't. Most likely, it will tend to nose up slightly (stall). If, after several similar launches, it keeps doing the same thing, add a 1/32" shim to the trailing edge of the wing platform. This will lower the angle of attack of the wing. If the plane does not stall, but dives into the ground (Sketch 9), add a 1/32" shim to the trailing edge of the stab platform. After the shims have dried, glide again. Keep adding shims until the plane has a glide with little or no stall or dive tendencies. Now, when we fly this model under power, we don't want it to glide straight ahead, but in circles. Otherwise, we will end up on a real cross-country chase; so add a 1/16" shim to the stab platform on the left-hand side (view from the rear), so that the stab is tilted with its left tip higher than the right tip. This will cause the plane to glide in left hand circles. 1) First flight: set the timer to run only three or four seconds. Put your prop on backwards. Start engine and open needle valve enough so that engine runs a bit rich; light your dethermalizer fuse, and push the plane gently into the wind with a slight "up" angle as you release your timer. The plane should go straight ahead and up, or slightly to the left and up. 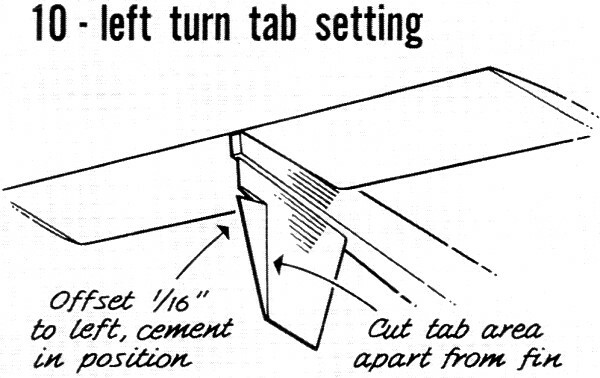 If it doesn't, cut a small tab (Sketch 10) and bend and glue it so that it has about 1/16 in. left rudder, and repeat this step. If it flies correctly and has no violent tendencies, proceed to step 2. 2) Put the prop on the correct way, set the timer for five or six seconds, lean the engine out, light the fuse, and release gently into the wind, after releasing the timer. Again, the plane should climb almost straight, or slightly to the left at a high angle. After the engine cuts, check the glide - if it stalls, take out part of the stab trailing edge shim, if it dives, take out the wing shim. If the plane glides in wide left-hand circles, proceed to the next step. If it doesn't, add a bit more stab tilt. 3) Set the timer for about ten seconds, lean the engine out all the way so that it is running as fast as it can, and then turn open the needle valve about 1/4 turn; light the fuse and launch into the wind at about a 45- to 60-degree angle. The model should climb quickly at a high angle, with a slight left turn. When the engine cuts, it should pull out into a wide left-hand glide circle. 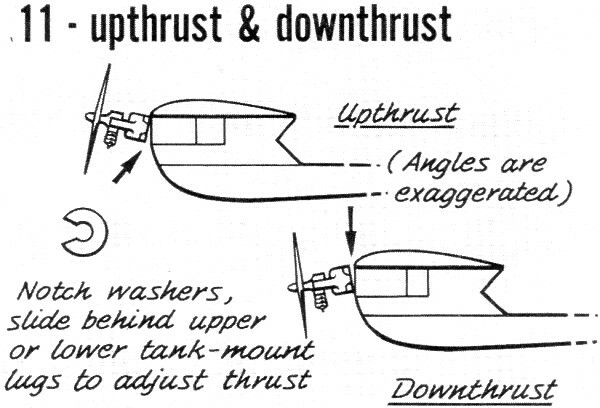 If your plane climbs with a shallow angle, add upthrust (Sketch 11). If it climbs too steeply and tends to loop over onto its back, add downthrust (Sketch 11). If everything is right at this point, you are ready to increase your engine run to the full amount - 12 seconds for hand launch and 15 seconds for a vertical takeoff. Be sure to light the fuse. 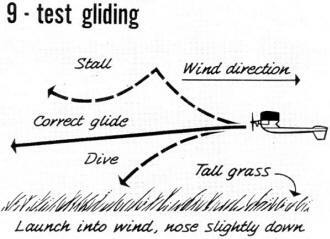 When the power cuts, does the plane tend to flounder around for awhile before going into a left-hand glide pattern? (Meanwhile, it is probably losing altitude much more rapidly than is necessary.) If this is the case with your model, you have a power-to-glide transition problem. To solve it, add a slight bit more left turn to the rudder tab, or tilt the stab an extra 1/32 in. Or you may wish to add a slight bit of left thrust to your engine (just add a shim washer behind the fuel tank where it bolts to the firewall on the top, and bottom bolts on the right side - this tilts the engine left). With all of these changes, it is wise to recheck your plane according to the three steps above. Conclusions: Write your name and address on the model, so you can get it back in case of loss. But try not to lose it by always using a fuse - and always light it! Never forget to release your engine timer. Practice so that you know what your plane is going to do each time you let go of it. Pylon: The portion of a model which raises the wing a distance above the fuselage. Also, a type of model which has the wing mounted above the fuselage on a pylon, the engine being mounted on the front of the fuselage proper. 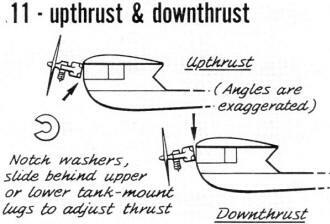 High-Thrust: A model in which the engine is mounted above the fuselage proper, usually near the wing line. 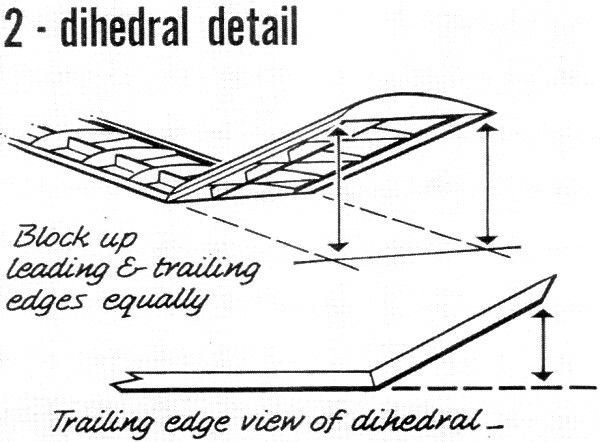 Dihedral: The bend in the wing of a model which raises the tips above the center panel. Adds stability. 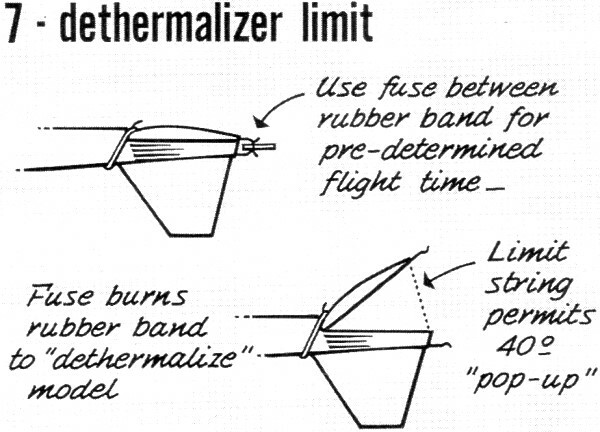 Dethermalizer: A device, usually a fuse or timer, used to bring the model down after a predetermined amount of time - usually three or five minutes. Incidence: The angle of the wing, or stab, on the fuselage. Usually the wing is angled several degrees more than the stab angle. Stab-Tilt: A device used to turn the model in the glide. One side of the stabilizer is raised above the other. Has little effect on the power portion of flight. Vertical Take Off: When the model is launched from the ground with one point, usually the rudder, touching the ground. 1) Half of the problem of consistent flying can be whipped by building sturdy wings and stabs. 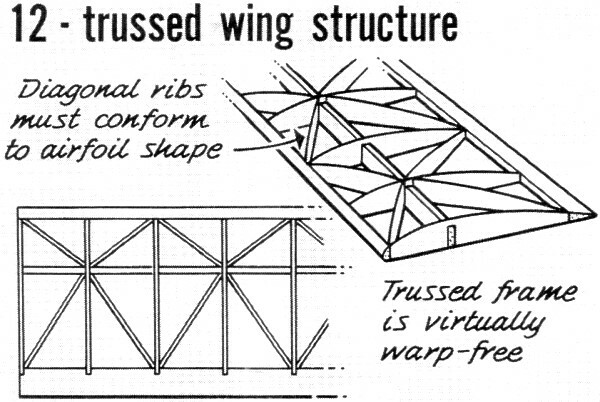 Trussing is perhaps the best and lightest way of achieving this goal (See sketch 12). 2) There is nothing like knowing exactly what your model is going to do each time it is launched. Build correctly and sturdily (not heavily) and practice flying in all kinds of weather. Get the timer set so that it shuts off just under the limit - there is nothing worse than an engine overrun in the wind with a five-minute fuse. Check your dethermalizer timer settings or fuse lengths to avoid dethermalizing too soon or too late (losing a trophy in the first case and a plane in the second). 3) Pressure fuel systems. Pressure gives clean and positive fuel shut-offs and the advantages of steady power. Also, if you bore out your venturi, it will give you a bit more power. 4) Short nose lengths (nose moment arms). Some modelers will disagree with this statement, but I've seen it work. If you can eliminate some of the frontal overhang, you will get better stall recovery and pull-out after the power cuts, because there is less inertia to overcome. 5) Keep it simple. Excess gadgetry just gives you that much more to go wrong. Everything you use should be as fool-proof and dependable as possible. Leave auto-rudder and auto-stab to the experts. 6) Go to a contest with a winning attitude; you have a better chance of taking home the hardware. Think positive. Above all, put in all your flights. Don't quit when behind - even experts make mistakes. 7) Give competition credit for ability. Do your best to be better. This gives you something to shoot for. If you convince yourself your opposition is going to "max out," you will have to do the same - and more. 8) Know the flying area. If possible, try to fly the day before the contest on the site where the meet is to be held. In that way, you can figure on the best chase routes for retrieving. You also find the "hole-spots" and thermal areas. 9) Be prepared. Go to the contest with everything you need to fly. This includes repair materials as well - glue, pins, dope, razor, brushes, and tissue.